Leandra Lacy says she began her EASL internship without gardening experience, but has loved working in the garden and building relationships with members of the community. Emory Photo/Video. DeJa Love says she's received much more than she has given this summer working in the Super Giant Community Garden on Donald Lee Hollowell Parkway. EASL interns DeJa Love and Lara Martin work in the Super Giant Community Garden greenhouse, which had its official grand opening earlier this month. Emory Photo/Video. 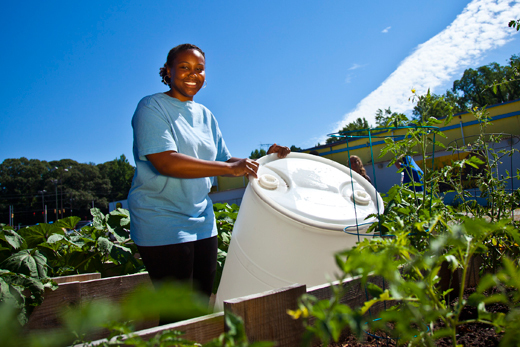 The garden, run by the Emory Urban Health Initiative (UHI), aims to address the issue of healthy food access in Northwest Atlanta by providing the community with a more nutritious selection of foods. The area is considered a food desert, marked by limited access to grocery stores, fresh foods and convenient transportation. The community garden is located in the parking lot of the Super Giant Foods grocery store, which is also working to expand healthy offerings. Organizers hope to eventually create a "Healthy Hub" for the area that will include a community kitchen, health clinic, childcare facilities and a laundromat. In addition to garden tasks of watering, weeding and planting, Love's main role is to engage the community. "We have several regulars who come in," says Love, who has spent many hours at the site this summer. "We connect with them about nutrition and healthy living. Being a listening ear, that's what my job has turned into." It's clear that Love wouldn't have it any other way. Love came to the garden as a summer intern in Emory's D. Abbott Turner Ethics and Servant Leadership (EASL) Program. She and 30 other Emory undergraduate and graduate students from across the University have been working for some of Atlanta's best-known public policy, arts and charitable organizations, while completing a non-credit ethics course on what it means to be not just a leader — but a servant leader. The summer internship program is just one feature of the EASL Program, now well into its second decade. The program, based in the Center for Ethics, boasts a year-round curriculum and alumni who have gone on to become doctors, lawyers at the International Criminal Tribunal for the former Yugoslavia, nonprofit directors, university chaplains and more. The program's top goal, says EASL Director Edward Queen, "is to take highly qualified and committed Emory students who are going to be successful no matter what they do, and infect them with the virus of community service and community obligation." The ultimate aim? "Creating the next generation of community leaders," he says. About one-third of the students are working for environmental and sustainability nonprofits, says Queen. "There's a strong sense of commitment to that topic and what's going on in the community," he says. Several of the nonprofits run urban gardens that are proliferating in Atlanta, and EASL interns can be found at garden sites throughout the city, getting their hands dirty. Ethics and Servant Leadership intern DeJa Love tends plants in the Super Giant Community Garden. Emory Photo/Video. "I don't have any gardening experience; I was very transparent about it," says Leandra Lacy, an MPH student and fellow EASL intern working with Love at the Super Giant Community Garden. "But it seemed like a good way to engage the community." In addition to her gardening duties, Lacy has planned outreach events and managed communications and public relations for Emory's UHI. "But work in the garden, meeting community members and building those meaningful relationships with them was definitely my favorite part," she says. "Being a woman of color, born and raised in the South, I want to dedicate my life to improve health in whatever way I can," Lacy says. "I really believe knowledge is power, and I want to spread as much knowledge as I can. "That's why a garden is such an important part of summer," Lacy explains. "I live less than a mile away from a Kroger and a Publix. To be in an area of Northwest Atlanta that's a food desert — besides the Super Giant and the garden in the parking lot, there isn't another grocery store within a 10 mile radius — was hard for me to fathom. I'm just glad that I'm in this place where I can be present and really get to know the people there and help open up access to healthy food." "A lot of times there's a temptation to publicize everything you do and slap it on a resume, make it look glamorous to try to draw attention to yourself and what you're doing. It doesn't make you cool with your friends. But important things don't always get you somewhere; they just need to be done." "One of the strengths of Global Growers is that we are able to work as co-workers with farmers who come from international locations, who have incredible skill and ingenuity. I really appreciate that." "Over the three years I've been here, I've learned a lot from the interns and their perspectives . . . Charlie (Marvil) is a hardworking and dedicated young man. He's not only brought his mind to the work, but he physically challenged himself. I'm proud of him for his dedication and ability to push himself." "It's exciting for me as an alumna to stay connected with Emory. In addition to (EASL intern) Barrett Smith, we also have Emory Scholar interns Matthew Niedes and Henry Chappell working in the garden . . . having their help has a significant impact on what we're able to accomplish during the growing season." "We're in the process of organizing a food co-op with Georgia Avenue Cooperative Ministries. (EASL intern Jonathan Warkentine) has been great at helping connect us with the mosque down the street . . . that's a unique attribute that Jon brought to us."